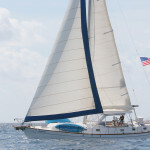 When working with the best yacht charters, Virgin Islands trips can become the sources of truly enjoyable experiences. How far can you go, though, and how much can you ask from a yacht charter company when you want to organize something really special either alone, with your partner, loved ones or friends? Memorable family reunions with accommodation and services for all your family members. If you’re into yacht charters, Virgin Islands services can provide you with numerous options that can spice up your vacation. The most important thing to remember, however, is that you have to tailor your selection according to what your trip would actually entail. For example, if you want to explore the US or British Virgin Islands by yourself, most companies will be able to help you, but you’ll have to narrow your search down a bit when you want to organize a wedding, a honeymoon or a long family vacation. Bareboat sailing can be a great option if you want to feel like the pirates of old, navigating the seven seas, while skippered yacht charters will provide you with a convenient, relaxing vacation in which you only have to sit back and enjoy the view. A less expensive option can be a cabin or berth charter on a larger yacht which is an ideal choice for smaller groups who love to socialize. Whether you’re interested in sailing through the Caribbean or visit the British or US Virgin Islands in style and elegance, Sopris Charters, one of the leading charting companies offering these services, will provide you with the finest options when it comes to choosing the right boat and yacht equipment for anything from a romantic trip out to sea to an exciting parasailing vacation. It is no secret that when it comes to yacht charters, Virgin Islands vacations can truly provide you with the most unique and exciting experiences regardless of the purpose behind them.